I’ve just returned to Poznan, Poland after having completed an amazing self-guided bicycle tour down the Danube river with a company called Rad & Reisen. The trip started in Passau, Germany and over the course of 8 memorable days, took me through Austria, Slovakia and Hungary as well. Plus, I was lucky enough to be accompanied this week by Kasia (the recipient of the 2012 Bicycle Tourist Pro Travel Scholarship) and more than 100 other bicycle touring adventurers from all around the world. On each day of the bicycle tour, my fellow tour participants and I were given pannier-free bicycles and traveled down flat, well-marked bike paths along the Danube River. We were all free to chose our own travel companions, venture off on our own if we liked, and travel at our own pace. At night, all the tour participants made it back to the “My Story” river boat, where we were wined and dined with abundant food and beverages by the friendly boat staff. Then we crashed in our comfortable bedrooms on the boat each night… and woke the following morning to do it all over again in a new and interesting part of the world. If you listened to that long bicycle touring interview I conducted earlier this year, you will know that I’ve struggled with social anxiety most of my life. Up until only several years ago, I didn’t do well with groups of people and I preferred to keep to myself. So, bicycle touring has been the perfect venue for me. In the past I always wanted to ride alone, or just with one to two other people. I never would have dreamed on going on a group bicycle tour with a whole lot of people. In fact, my website at www.bicycletouringpro.com is mostly geared for those who want to learn how to conduct a successful self-supported bicycle touring adventure – a type of bicycle tour where you carry your own gear and are responsible for your own food and sleeping arrangements each and every night. This is the type of bicycle touring that is most popular with solo travelers. But, I am also the creator of www.gobicycletouring.com, where people like you can find the very best guided and self-guided bicycle touring experiences from all around the world. The tours listed on this website are the type where the tour company handles all the details for you, makes it possible to ride each day without carrying a bunch of weighty gear on your bicycle, and all the food and sleeping arrangements are taken care of for you every day. You simply show up for the start of the bike tour and enjoy the cycling experience! After more than a decade of traveling on my own and conducting self-supported bicycle tours in dozens of different countries all around the world, I’ve recently started experimenting with guided and self-guided bicycle tours… and you know what? I really, really like them!!! In 2012 I conducted an incredible guided bicycle tour across Switzerland. In 2013 I cycled across South Africa on a guided mountain bike tour, and later that year I did another week-long bicycle tour through the Loire Valley in France. Each of these cycling experiences was different and wonderful in their own unique ways. So, here’s what I’ve learned about bicycle touring this last week: I’ve learned that occasionally splurging and going on a guided or self-guided bicycle tour can be a wonderful way to travel! This week on the Danube Waltz boat and bike tour with Rad & Reisen I had a great time meeting with all the people from so many different countries, practicing my German, and learning that my social anxiety doesn’t bother me nearly as much as it used to! Kasia and I were the youngest members of the tour group this week, but I was thrilled to see so many people in their 50s, 60s, 70s and even 80s, out on the bike paths and enjoying the culture and beauty that surrounded us. My goal for next year is to get my mother to go with me on this bicycle tour down the Danube River. She’s only been to Europe once in her whole life (when she was 15 years old) so I know that she would love this experience. A bicycle touring trip, to me, is about freedom. Freedom from constraints, routine, highways, gas stations, and strict time schedules. However, when planning for or booking a bike trip, there are many details to take into consideration. Of course, not all people’s needs are alike. That’s why this Tuesday, June 3, I will be conducting a webinar on “getting to the start of your bicycle trip” and talking about what is needed to be done before you leave home… and then what you need to do on that first day of cycling once you reach your destination. I will speak for about a half hour, and then I will be available to answer any questions you might have about planning, preparing for or executing your own bicycle touring adventures. The webinar will be $9.95 to attend. 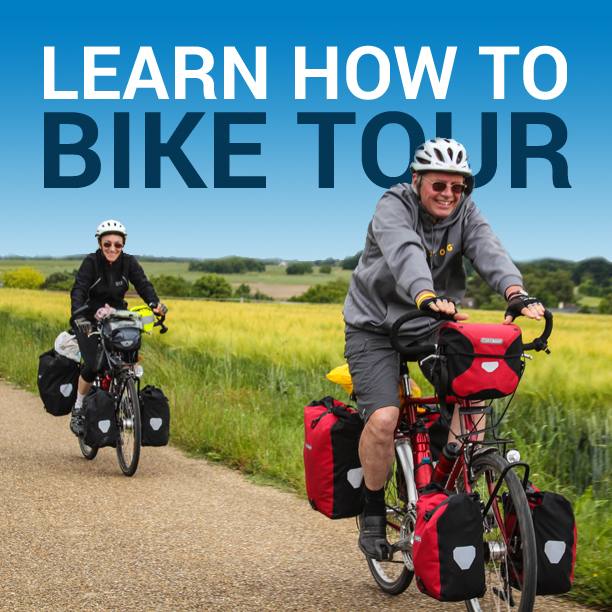 However, if you have purchased “The Ultimate Bicycle Touring Course,” the webinar will be FREE to attend. In case you didn’t know, if you sign up for The Ultimate Bike Tour Training Course, you are automatically invited to attend my monthly webinars free of charge. These webinars are part of your course… and if you can’t attend at the time of the webinar, I will send you the webinar recording after it is completed (at no additional cost). For those of you who haven’t purchased The Ultimate Bike Tour Training Course and are interested in simply attending this month’s live bicycle touring webinar, the cost is only $9.95 USD and you also will receive the recorded webinar video if you are unable to attend. There are three main types of bicycle touring: self-supported, guided and self-guided. Each type of bicycle tour has its advantages and disadvantages. It just depends on what you are looking for. I also want you to know that you are never too old or too young for bicycle touring. Bicycle touring is such an inspiring way to travel – especially when compared to being cooped up in a car or bus and simply watching as the beauty of the world races past. Bicycle touring allows you to travel at a pace that you are comfortable with and to cover as much ground as you like. You can travel alone or with a group. The choice is up to you… and there are so many wonderful experiences out there waiting for you! My goal is to inspire and teach others across the world about the wonderful world of bicycle touring. I hope that you will join me on Tuesday, June 3 where I will share my knowledge with you and answer any questions you might have. Here’s to seeing you out on the road. This entry was posted in Bicycle Touring Pro Articles, Europe, Locations, Website Announcements and tagged activities for old people, bicycle touring course, bike tour training, bike tour webinar, danube waltz, guided bike tours, rad and reisen, sports for old people, ultimate bike tour training course.